Myles and his mother and siblings are traveling overnight. They’ve been driving for days, moving to join Myles’s father who’s gone ahead to their new house so that he can work at his new job. The family’s final, late-night drive becomes a harrowing adventure as Myles encounters magical and ghostly forces in their new island home. In Myles and the Monster Outside Philippa Dowding has written a quick read and the perfect type of ghost story. It’s weird, filled with foreboding and laced with the uncertainty of being seen through the eyes of extremely tired travelers in the middle of the night. This is a fun read for middle grade readers at any time, but it’s an especially good choice for those eagerly anticipating Halloween! 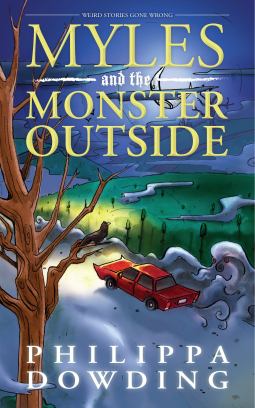 I read Myles and the Monster Outside as an electronic ARC courtesy of Dundurn Books and NetGalley.